Your bathtub is worn out, hard to clean, damaged? Do you know, if your tub has rust or a simple scratch, it will continue to get worst a day by a day. And this will cause a major problem, if it’s not fixed. 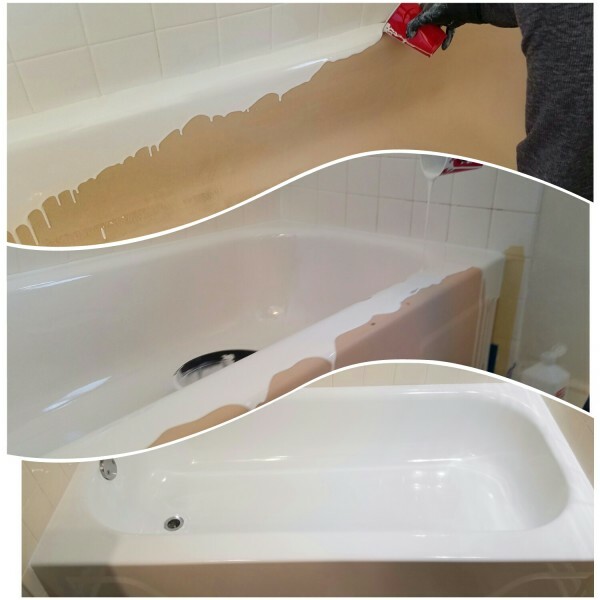 The bathtub Reglazing​/Refinishing/Resurfacing is the perfect cost effective alternative to make your tub look like new again. Of course you could replace that old bathtub, but are you ready for a headache that comes with remodeling? Replacing fixtures takes time and money.Reglazing though, can save you thousands of dollars and weeks of hassle. According to the National Kitchen & Bath Association (NKBA) the average cost of removing and replacing a bathtub is about $2400 and even more. Reglazing will cost a fracture of that. 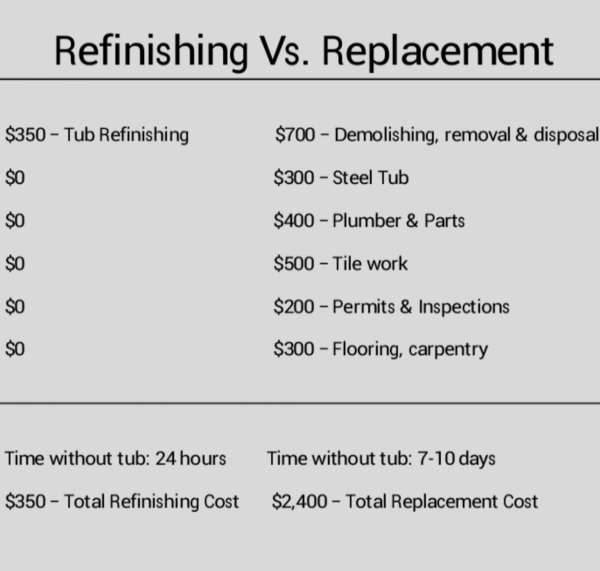 Our tub reglazing requires no demolition and it will be done without causing inconvenience to you and your family. Our company uses most up-to-date techniques you can find on the market. In fact, most people can’t tell the difference between a refinished tub and a new one. We can transform the look of your bathroom in 4-6 hours, and you can use it the next day. With replacing your bathroom could be “Out of order” for weeks. Even badly eroded tubs can be saved with our professional solution. Using the most effective and durable materials available, we provide long lasting finished surfaces that resist abrasion, mold, corrosion and mildew. Estimated lifetime of the finish is 10-12 years. Companies that use the traditional method of applying glaze (spray method) usually use polyurethane based glaze, which absorbs water. Water gradually reaches the original tub surface through the spray glaze causing the decay of new surface. This usually happens under tub mats and under broken (leaking) faucets. The glaze we use is absolutely waterproof, and does not have this flaw. You can use a bathtub mat and be sure that it will not harm the new surface. Using the spray method will also leave a foul smell in the room for numerous days, even if an industrial fan was used. Our material is odorless. Glaze applied with our method is almost five times thicker than the other methods. The material is also very strong and has outstanding adhesive properties. Due to the mentioned features, we are able to extend your tub’s life by ten to fifteen years. ​​ ​​Liquid Tub Liner(LTL) ​is self-leveling high viscosity, two components polymer coating designed for cast iron, steel and fiberglass bathtubs resurfacing. ​​ Odorless. No hazardous solvent used in production of the material. ​ No spray involved. Pouring method is used. ​ Great adhe​sion for cast iron, steel and fiberglass bathtubs. ​ High durable mirror gloss finish. ​ Lifetime of the finish more than 15 years. ​​ Curing time - 24 hours. We introduce an innovative method for bathtub restoration. What makes our process so unique is two fold. LTL is the latest most cost efficient brand name in the Bathtub restoration industry. LTL is a high adhesive two part components enamel. It is extremely durable and 100% waterproof. And it is even odorless during application. This characteristic especially has proven to be ideal and indispensable in various populated structures with a central ventilation system: such as hotels and residential dwellings. The second part that has made LTL so successful is its revolutionary application procedure that we refer to as ,,Pouring,,. We first premixe the two components of LTL and then pour on to the prepared Bathtub surface. The pouring method is perfect as it results in a smooth and glossy 1-2 mm thickness. This is 5 x's thicker than company provide with their spray practice. The end of our polymerization approach is brand new great looking solid surface.